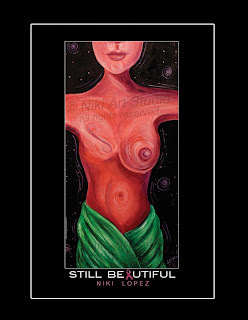 Nikiartstudio.com and Susan G. Komen for the Cure - Miami/Ft. Lauderdale foundation. So finally its up! I have a work of art that was juried into a huge poster show and shown in south Florida and New York. "Still Beautiful" If you see the piece, you may agree there is no explanation needed. Recently, I have partnered with the Miami/Fort Lauderdale Susan G. Komen for the Cure foundation and made a commitment to give a portion of each sale as a donation.